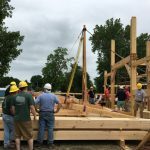 Over the weekend of June 17th-18th, 2017 I participated in the main frame raising of the Champlain Canal Region Gateway Visitors’ Center in Schuylerville, New York. The building was selected as the Timber Framers Guild Community Building Project for 2016. 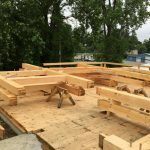 The timbers were cut to size and much of layout completed in the summer and fall of 2016 but delays in the construction of the foundation pushed the frame raising back until the summer of 2017. 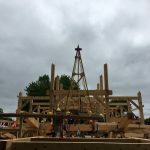 From June 14th-16th volunteers and guild members assembled bents, prepared the worksite and raised the first two bents. On Saturday, June 17th additional volunteers arrived and the remainder of the Gateway Visitors Center frame was raised. The bents were raised “by hand” using an A-frame, that was guyed at two ends, as the focal point for the rigging. Once the frames were rigged, two lines, with about 20 people in each, pulled on the haul lines until the frame was upright and free-hanging. Workers on the deck then guided the posts into pockets in the flooring as the haul teams lowered each bent. The bents were then braced and floor joists installed, connecting each bent to the next. A crane was used to install the tie plates, purlins and rafters while workers straddled timbers or worked form scaffolding to receive each unit. Once each piece was lowered into to place a gang of hammer swingers went to work driving 7/8” or 1” diameter round pegs into the mortise and tenon joinery, tying the frame together. It was a long day but the crew managed to finish raising the main frame just before sunset. 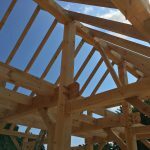 This being my first experience working on a timber framing project I was impressed with the accuracy required in the layout and cutting of joinery. It is amazing how each piece fits perfectly onto the receiving member even when there are multiple connection points along a given unit. 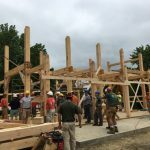 I would be remiss if I didn’t commend project manager Neil Godden for a safe and efficiently run project and acknowledge all of the instructors for their hard work and patience with those volunteers who were unfamiliar with timber framing. 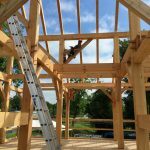 You can read more about the project on the Timber Framers Guild Community Building Project blog.